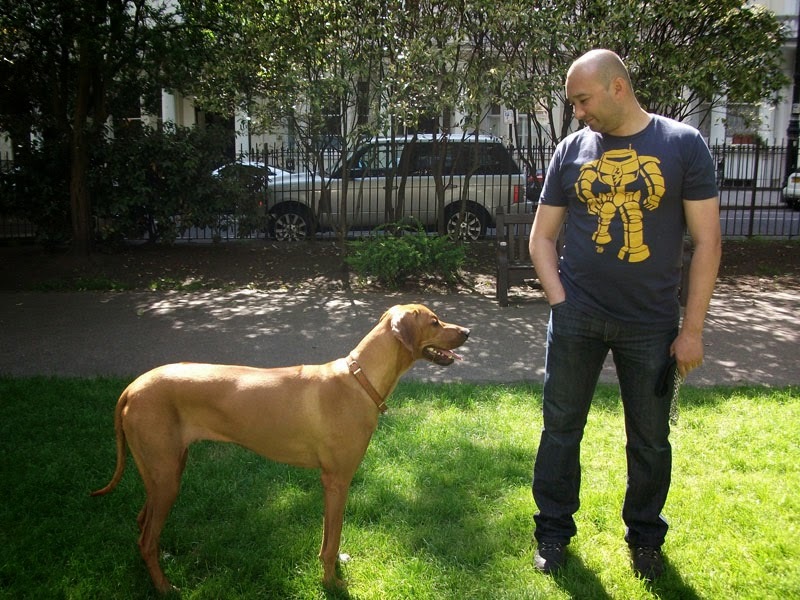 Classes are starting again in South Westminster on Saturday 7th May 2011, and every 'dog owner' in South Westminster can register for the classes tommorrow at the Dog Workshop. 'All Breeds of Dogs' are dear to my heart and with patience, understanding their body language, vet checks and lots of TLC you can have a 'lifelong' companion' who will love you back unconditionally. Look forward to meeting the new 'dogs on the block' and their owners tommorrow! Grace is a a beautiful Staffordshire Bull Terrier, who in her first few months of life knew only neglect and abuse, UNTIL Venetia decided she would rescue Grace. 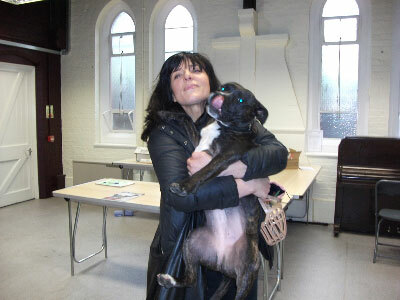 Grace was scared at first but with loving care from her new owner Grace learnt to 'Trust Again'. As you can see in the photo above Grace is very much a well loved and socialised dog. A credit to her 'new owner, Venetia - and now lives happily with an elderly cat. (Sleeping on the sofa together)!!! Its great when there is a 'Doggy Happy Ending' after such a bad start in life! 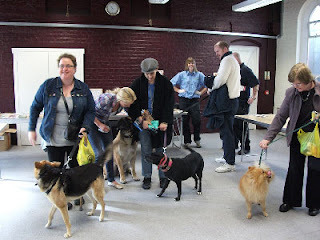 On Monday April the 4th 2011 we held our first Dog Clinic at St. Judes Hall in Queens Park W10. This event was very successful with general health checks and free micro chipping offered to the first five attendees carried out by the Westminster Dog Warden's. Thanks to Guy Sanderson from City West Homes Westminster and Westminster Dog Wardens for all their help in the organisation and participation of this event. 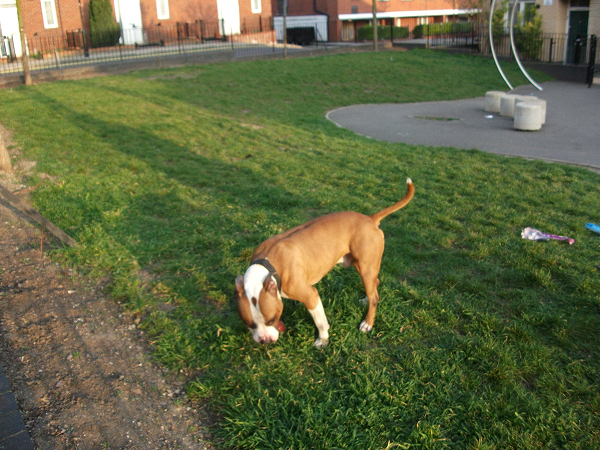 Polo is a two year old Staffordshire Bull Terrier who was one of the dogs attending dog socialising classes in Queens Park West London. Regarding breeding and how so many bull breeds end up in animal rescue homes, education regarding neutering these breeds is essential. Today Polo's owner will be taking him to be neutered at the Mayhew Animal Home in West London. April 4th which is 'Stray Animals Worldwide' Day there is an event in St Judes Hall, Ilbert Street, London W10 commencing at 10am - 12pm. The Local 'Westminster ' Dog Warden will be there to offer FREE MICROCHIPPING to the first five 'dog owners' that arrive and £10 to anyone that comes later. I will be there at 10am -12pm to offer advice on dog training, spaying and neutering and any behaviour problem. I will also be giving out Free neutering/spaying vouchers to all 'bull breed' dog owners. (To be taken to Mayhew Animal Home, Trenmar Gardens, Kensal Green NW10). RAFFLE to be drawn at 12pm.